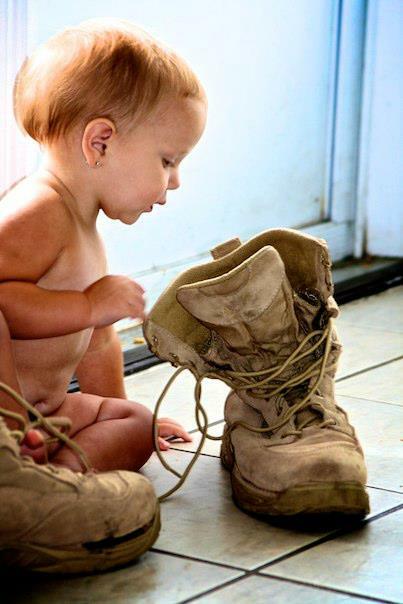 Anastin Dorr plays with her Daddy's military boots. Photo by Jackie Dorr. 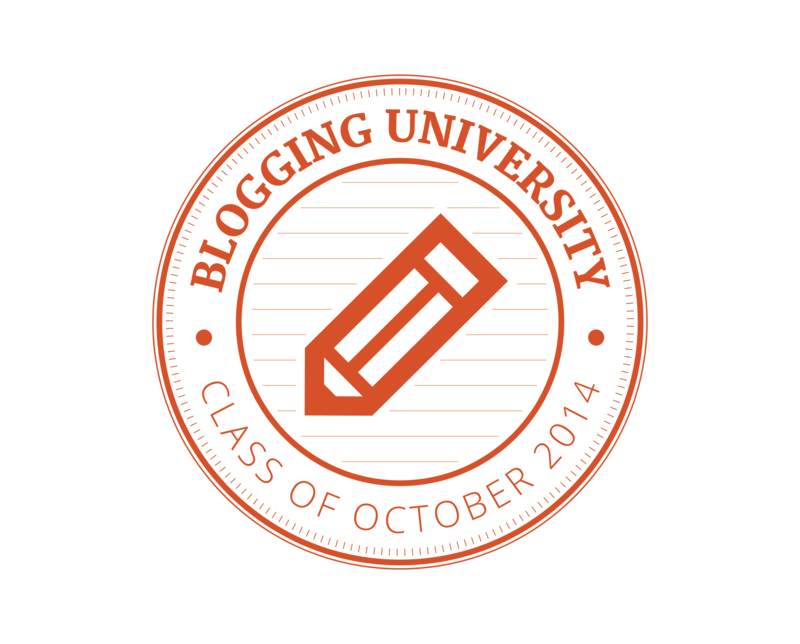 “Five Year, Two Kids and Four Deployments Later” – That phrase is from Jackie Dorr’s first blog post. As an Army Wife and former president of the MacDill Enlisted Spouses Club, she managed to capture the essence of military married life to a spouse who is deployed more often than he’s at home. Here’s a portion of that entry, but I encourage you to take a few minutes and read the entire post. So what does being a wife to a deployed soldier mean? What is the life like? When cleaning, I will always clean around the dirty pair of socks laying on his side of the bed ( he took them off the day before he left and left them there for me to wash). They remind me of him, so they will stay there until he comes home, as will the three pairs of shoes under the coffee table. When I change the sheets on our bed, his pillow will remain untouched, even if it is the wrong color, it still smells like him and makes me feel closer to him. 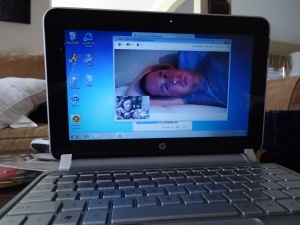 Christmas 2010 with Daddy who was 8 hours ahead of our time, yet he stayed awake to web cam with us. Photo by Alexandra Fuller. She meant no ill will by asking this question. To her, our life is not normal. I have been asked many questions about our life and his career. Yet, this particular question really made me stop and think: What is the definition of a normal family? Repairing front line trench after bomb explosion fifty yards from enemy trenches. D. W. Griffith in civilian clothing. During filming of the motion picture "Hearts of the World" in France (1917) Photo courtesy of the National Archives and Records Administration. “I fear they do not know us. I fear they do not comprehend the full weight of the burden we carry or the price we pay when we return from battle.” – Adm. Mike Mullen addressing the West Point graduating class Spring 2011. I began this blog with the mission of bridging that gap of understanding between military families, veterans and civilians. As evidenced by Adm. Mullen’s speech to the cadets, there’s a lot that still needs to be done. It’s a two-way street. Civilians need to understand the sacrifices at home and abroad made by military service members and their families. But, veterans and military also need to understand civilians’ attitudes, be patient sometimes and help educate when needed. Why does it matter? Because those who have fought in Operation Enduring Freedom and Operation Iraqi Freedom will be living with that “burden,” to quote Adm. Mullen again, for decades to come. Think about it, the last known WWI combat Veteran, Claude Choules, just died this year, but the war ended 93 years ago. Care for OEF/OIF Veterans will be needed for decades to come. Yet, if the gap continues to grow and fewer civilians have family military connections, providing Veterans care and fulfilling their needs could become challenging if there’s a lack of understanding of their sacrifice. A smaller share of Americans currently serve in the U.S. Armed Forces than at any time since the peace-time era between World Wars I and II. Afghanistan and Iraq wars are the longest period of sustained conflict in the nation’s history, yet, just one-half of one percent of American adults has served on active duty at any given time. As the size of the military shrinks, the connections between military personnel and the broader civilian population appear to be growing more distant. Roughly two-thirds of those with family ties to the military say that, since the wars began, they have done something to help someone in the military or a military family. Fewer than half (47%) of those without family ties to the military say they have reached out to help a service person or a military family. Young adults, ages 18-29, are much less likely to have family ties to the military (only 33 percent) compared to adults, ages 50-64, with 79 percent having family military ties. Improve your memory, mood and get mentally fit. Dr. James Bender offers some tips on why and how to improve your mental outlook for 2012. He suggests making it one of your New Year’s Resolutions. Bender is a former Army psychologist who deployed to Iraq as the brigade psychologist for the 1st Cavalry Division’s 4th Brigade Combat Team out of Fort Hood, Texas. The following tips are from his monthly contribution to the DCoE Blog on psychological health concerns related to deployment and being in the military. Good nutrition is important for your physical and mental health. There’s a lot of evidence showing that omega-3 fatty acids and folate help the brain. Aerobic exercise isn’t only good for you physically; it’s great for your brain. It improves cognitive performance and lowers stress. Get a professional opinion if you’re often feeling depressed, anxious or suspect you may have a psychological health condition. Give your brain a workout. Learning a new language, musical instrument or playing chess are all ways to improve concentration. Sleep is very important for memory and overall mental health. Be socially active and foster relationships. This tends to reduce stress, symptoms of anxiety and depression, and provide support. 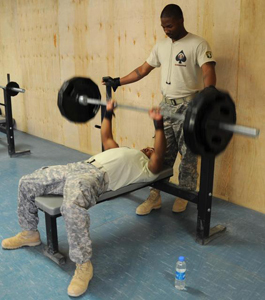 Additional tips on how to stay mentally fit are available on the Real Warriors – Real Battles – Real Strength website. Reports of sexual assaults increased in the past year at the military service academies according to the Department of Defense Annual Report on Sexual Harassment and Violence for the academic year of 2010-2011 which was just released. The report shows an increase in 2010-2011 with 65 reports of sexual assault involving cadets and midshipmen, compared to 41 reports in the previous academic year. 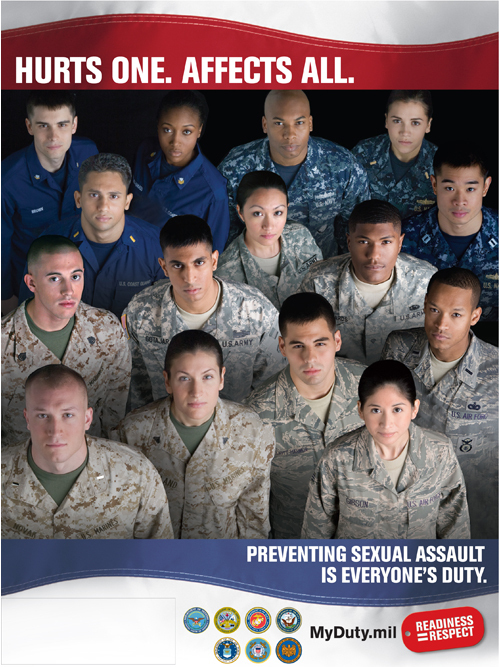 “One sexual assault is one too many,” Defense Secretary Leon E. Panetta said in a DOD news release. Site visits were conducted at the U.S. Military Academy, U.S. 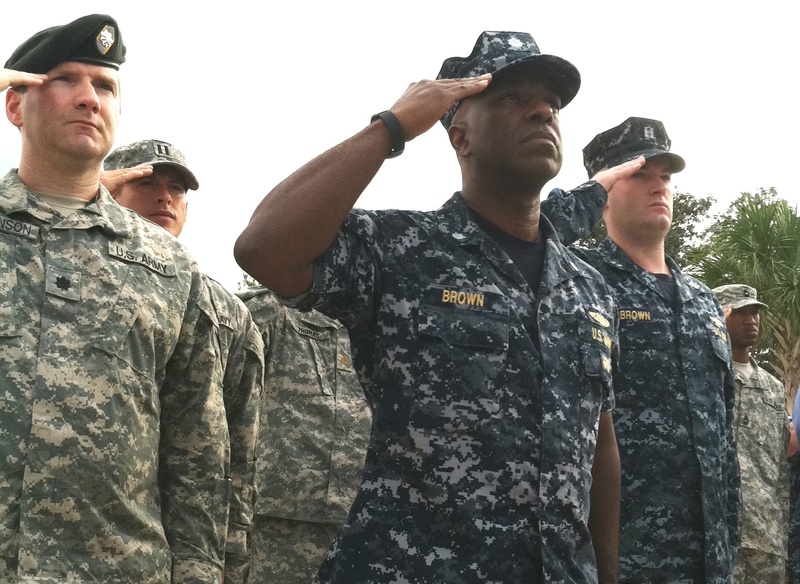 Naval Academy and the U.S. Air Force Academy, to review policies, trainings, and procedures. Cadets and midshipmen also participated in focus groups. The academies are being required to evaluate and measure their sexual harassment and assault prevention programs. One allows a service member who makes an unrestricted report of a sexual assault to request an expedited transfer to a new duty station. A restricted report, which is confidential, allows a victim to seek medical aid and counseling but is not communicated to the chain of command. The second new policy standardizes retention periods for sexual assault records across the military services to ensure victims have extended access to those documents. U.S. Central Command on Monday released an unclassified version of the investigation report into the deadly Nov. 25-26 incident near Afghanistan’s border with Pakistan. CENTCOM commander Marine Corps Gen. James R. Mattis directed the International Security Assistance Force to take a series of corrective actions after receiving the final report. Improve mutual trust among those working in the border areas. Clarify authorities, responsibilities and standard operating procedures for command, control and communication in near-border operations and develop formal training exercises and drills. Implement a program of full disclosure of all border area facilities and installations on both sides of the border, with systematic updates based on a common database and map. Before conducting any operation, direct all future coalition units and formations contemplating near-border area operations to confirm all installations near the border and the planned objective. To prevent friendly fire incidents, develop and share with the Pakistan military the common use of force-escalation measures such as show of force and other standard procedures. Consider harmonizing ISAF and Operation Enduring Freedom rules of engagement to promote clarity and transparency. The focus is to ease mistrust and miscommunication among those working in the Afghanistan-Pakistan border area which led to the deaths of 24 Pakistani soldiers. You can read the full Armed Forces Press Service article on the investigation report HERE. CENTCOM Memorial Service September 11, 2011 at MacDill Air Force Base, Tampa, FL. With 2012 fast approaching, you may be looking to make an end of the year donation to a non-profit organization that helps veterans, wounded warriors and military families. There are plenty of organizations out there helping, but Charity Navigator suggests before giving, check out the organization. The website has a ranking of non-profit groups that Support Our Troops. The free website rates each organization on its finances such as how much is spent on programs versus administration and fund-raising. The other areas rated are accountability and transparency. The information is clearly presented including graphs and information such as the salary of the CEO. Here is a partial listing from Charity Navigator of some of the top rated organizations that help military families and veterans. The Charity Navigator website includes thousands of organizations and has a top 10 list of highly rated military and veterans charities with the most reviews. There’s also an effective search engine so you can look up a charity and check out its rating, officers and finances before you give. The American Institute of Philanthropy also released a report rating various veterans charities. Those rankings are available HERE. And GuideStar is another website that rates non-profits, but only partial information is available unless you register. 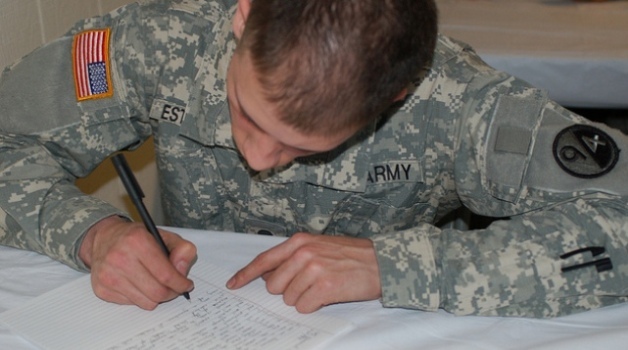 From VAntage Point Blog, a soldier putting down the sword for a pen in a writing program that is part of a holistic treatment approach to post-traumatic stress and TBI. The VA currently has more than 345,000 combined Facebook “fans” and is looking for more. As of this week, each of the 152 VA Medical Centers has its own page. “This event marks an important milestone in the overall effort to transform how VA communicates with Veterans and provide them the health care and benefits they have earned,” said Secretary of Veterans Affairs Eric K. Shinseki in a Department of Veterans Affairs media release. VA now has over 150 Facebook pages, 64 Twitter feeds, a YouTube channel, a Flickr page, and the VAntage Point blog. “Veterans of all eras are depending on us to get the right information to the right person at the right time,” said Brandon Friedman, VA’s director of online communications, and a veteran of Iraq and Afghanistan. The Department plans to continue expanding its Facebook presence while also focusing on bringing Twitter to every VA medical center as well. Below is a sample of the VA YouTube Channel, a piece prepared for Veterans Day 2011.